18 pp. Roman, 440 pp. As compared to the more classical frameworks which have been used in the past to deal with Swahili grammar, this book aims at an alternative approach. The author calls it Linguistic Empirical Grammar (LEG), whose basic principles are: explanatory relevance, plausibility, verification, confirmability and refutation. The author consequently applies these principles to the class system of Swahili, thus coming to unexpectedly new insights into the grammatical structure of this language, which other scholars of Swahili believed to be clarified and exhaustively described long time ago. 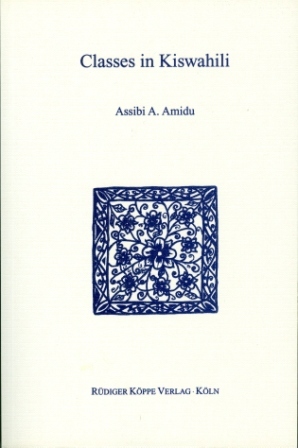 This monograph is a challenge to traditional linguistic thinking. It will certainly stimulate the debate on questions of linguistic description not only for Swahili but also for Bantu languages in general. In addition, this grammatical approach will open up for the reader entirely new perspectives of the structure of Swahili.